Football is the name of several similar team sports, all of which involve (to varying degrees) kicking a ball with the foot in an attempt to score a goal. The most popular of these sports worldwide is association football, more commonly known as just "football" or "soccer". However the word football is applied to whichever form of football became most popular in each particular part of the world. Hence the English language word "football" is applied to "gridiron football" (a name associated with the North American sports, especially American football and Canadian football), Australian football, Gaelic football, Rugby league, Rugby union, and related games. These rule variations are known as "codes." In most codes, there are rules restricting the movement of players offside, and players scoring a goal must put the ball either under or over a crossbar between the goalposts. Other features common to several football codes include: points being mostly scored by players carrying the ball across the goal line; and players receiving a free kick after they take a mark or make a fair catch. Peoples from around the world have played games which involved kicking or carrying a ball, since ancient times. However, most of the modern codes of football have their origins in England . While it is widely believed that the word "football" (or "foot ball") originated in reference to the action of the foot kicking a ball, there is a rival explanation, which has it that football originally referred to a variety of games in medieval Europe, which were played on foot. These games were usually played by peasants, as opposed to the horse-riding sports often played by aristocrat. There is no conclusive evidence for either explanation, and the word football has always implied a variety of games played on foot, not just those that involved kicking a ball. In some cases, the word football has even been applied to games which have specifically outlawed kicking the ball. Papi fut the five-a-side game played in outdoor basketball courts (built with goals) in Central America. Touch football — a non-contact version of rugby league. Often called simply "touch", in South Africa it is known as "six down"
These codes have in common the absence of an offside rule, the requirement to bounce or solo (toe-kick) the ball while running, handpassing by punching or tapping the ball rather than throwing it, and other traditions. The ball is hit into the air at the 2006 Royal Shrovetide Football match. Calcio Fiorentino — a modern revival of Renaissance football from 16th century Florence . :is the art of juggling with a football using feet, knees, chest, shoulders, and head. :is a small bean bag or sand bag used as a ball in a number of keepie uppie variations, including hacky sack (which is a trade mark). a modern take on keepie uppie where freestylers are graded for their entertainment value and expression of skill. :a compromise between Australian rules and American football, invented in Melbourne during World War II. :mixes Association football and volleyball and gymnastics; played on inflatables and trampolines. :a hybrid of Association football and baseball, invented in the United States in about 1942.
:a combination of American football, soccer, and basketball, devised in the United States in 1912.
:A hybrid of Australian rules and rugby league, trialled in Sydney in 1933.
:a game resembling Association football and European handball, devised by Italian fascist leader, Augusto Turati, in the 1920s. :also known as Murderball, invented in Canada in 1977. Based on ice hockey and basketball rather than rugby. The Ancient Greeks and Romans are known to have played many ball games, some of which involved the use of the feet. The Roman game harpastum is believed to have been adapted from a team game known as "επισκυρος" (episkyros) or phaininda, which is mentioned by a Greek playwright, Antiphanes (388–311 BC) and later referred to by the Christian theologian Clement of Alexandria (c.150-c.215 AD). The Roman politician Cicero (106-43 BC) describes the case of a man who was killed whilst having a shave when a ball was kicked into a barber's shop. These games appear to have resembled rugby football. Roman ball games already knew the air-filled ball, the follis. Documented evidence of an activity resembling football can be found in the Chinese military manual Zhan Guo Ce compiled between the 3rd century and 1st century BC. It describes a practice known as cuju (蹴鞠, literally "kick ball"), which originally involved kicking a leather ball through a small hole in a piece of silk cloth which was fixed on bamboo canes and hung about 9 m above ground. During the Han Dynasty (206 BC–220 AD), cuju games were standardized and rules were established. Variations of this game later spread to Japan and Korea , known as kemari and chuk-guk respectively. By the Chinese Tang Dynasty (618–907), the feather-stuffed ball was replaced by an air-filled ball and cuju games had become professionalized, with many players making a living playing cuju. Also, two different types of goal posts emerged: One was made by setting up posts with a net between them and the other consisted of just one goal post in the middle of the field. There are a number of references to traditional, ancient, or prehistoric ball games, played by indigenous peoples in many different parts of the world. For example, in 1586, men from a ship commanded by an English explorer named John Davis, went ashore to play a form of football with Inuit (Eskimo) people in Greenland . There are later accounts of an Inuit game played on ice, called Aqsaqtuk. Each match began with two teams facing each other in parallel lines, before attempting to kick the ball through each other team's line and then at a goal. In 1610, William Strachey of the Jamestown settlement , Virginia recorded a game played by Native Americans, called Pahsaheman. In Victoria, Australia , indigenous people played a game called Marn Grook ("ball game"). An 1878 book by Robert Brough-Smyth, The Aborigines of Victoria, quotes a man called Richard Thomas as saying, in about 1841, that he had witnessed Aboriginal people playing the game: "Mr Thomas describes how the foremost player will drop kick a ball made from the skin of a possum and how other players leap into the air in order to catch it." It is widely believed that Marn Grook had an influence on the development of Australian rules football (see below). The Maori in New Zealand played a game called Ki-o-rahi consisting of teams of seven players play on a circular field divided into zones, and score points by touching the 'pou' (boundary markers) and hitting a central 'tupu' or target. These games and others may well go far back into antiquity and may have felt the growing pains of the elected officials also influenced which later affected football games. However, the main sources of modern football codes appear to lie in western Europe, especially England . The Middle Ages saw a huge rise in popularity of annual Shrovetide football matches throughout Europe, particularly in England. The game played in England at this time may have arrived with the Roman occupation, but the only pre-Norman reference is to boys playing "ball games" in the ninth century Historia Brittonum. Reports of a game played in Brittany, Normandy, and Picardy, known as La Soule or Choule, suggest that some of these football games could have arrived in England as a result of the Norman Conquest. 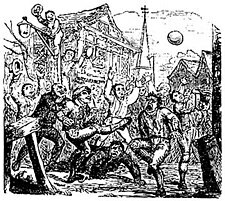 These forms of football, sometimes referred to as "mob football", would be played between neighbouring towns and villages, involving an unlimited number of players on opposing teams, who would clash in a heaving mass of people, struggling to move an item such as an inflated pig's bladder, to particular geographical points, such as their opponents' church. Shrovetide games have survived into the modern era in a number of English towns (see below). An early reference to a ball game that was probably football comes from 1280 at Ulgham , Northumberland , England: "Henry... while playing at ball.. ran against David". The first definite reference to a football game comes in 1321 at Shouldham , Norfolk, England: "[d]uring the game at ball as he kicked the ball, a lay friend of his... ran against him and wounded himself". There is also an account in Latin from the end of the 15th century of football being played at Cawston, Nottinghamshire . This is the first description of a "kicking game" and the first description of dribbling: "[t]he game at which they had met for common recreation is called by some the foot-ball game. It is one in which young men, in country sport, propel a huge ball not by throwing it into the air but by striking it and rolling it along the ground, and that not with their hands but with their feet... kicking in opposite directions" The chronicler gives the earliest reference to a football pitch, stating that: "[t]he boundaries have been marked and the game had started. "a football", in the sense of a ball rather than a game, was first mentioned in 1486. This reference is in Dame Juliana Berners' Book of St Albans . It states: "a certain rounde instrument to play with ...it is an instrument for the foote and then it is calde in Latyn 'pila pedalis', a fotebal." women playing a form of football was in 1580, when Sir Philip Sidney described it in one of his poems: "[a] tyme there is for all, my mother often sayes, When she, with skirts tuckt very hy, with girles at football playes." the first direct reference to scoring a goal is in John Day's play The Blind Beggar of Bethnal Green (performed circa 1600; published 1659): "I'll play a gole at camp-ball" (an extremely violent variety of football, which was popular in East Anglia ). Similarly in a poem in 1613, Michael Drayton refers to "when the Ball to throw, And drive it to the Gole, in squadrons forth they goe". 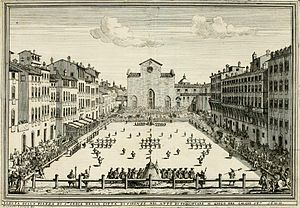 In the 16th century, the city of Florence celebrated the period between Epiphany and Lent by playing a game which today is known as "calcio storico" ("historic kickball") in the Piazza della Novere or the Piazza Santa Croce . The young aristocrats of the city would dress up in fine silk costumes and embroil themselves in a violent form of football. For example, calcio players could punch, shoulder charge, and kick opponents. Blows below the belt were allowed. The game is said to have originated as a military training exercise. In 1580, Count Giovanni de' Bardi di Vernio wrote Discorso sopra 'l giuoco del Calcio Fiorentino. This is sometimes said to be the earliest code of rules for any football game. The game was not played after January 1739 (until it was revived in May 1930). Numerous attempts have been made to ban football games, particularly the most rowdy and disruptive forms. This was especially the case in England and in other parts of Europe, during the Middle Ages and early modern period. Between 1324 and 1667, football was banned in England alone by more than 30 royal and local laws. The need to repeatedly proclaim such laws demonstrated the difficulty in enforcing bans on popular games.King Edward II was so troubled by the unruliness of football in London that on April 13, 1314 he issued a proclamation banning it: "Forasmuch as there is great noise in the city caused by hustling over large balls from which many evils may arise which God forbid; we command and forbid, on behalf of the King, on pain of imprisonment, such game to be used in the city in the future." The reasons for the ban by Edward III, on June 12, 1349, were explicit: football and other recreations distracted the populace from practicing archery, which was necessary for war. In 1424, the Parliament of Scotland passed a Football Act that stated it is statut and the king forbiddis that na man play at the fut ball under the payne of iiij d - in other words, playing football was made illegal, and punishable by a fine of four pence. "Spurn" literally means to kick away, thus implying that the game involved kicking a ball between players. King James I of England's Book of Sports (1618) however, instructs Christians to play at football every Sunday afternoon after worship. The book's aim appears to be an attempt to offset the strictness of the Puritans regarding the keeping of the Sabbath. While football continued to be played in various forms throughout Britain, its public schools (known as private schools in other countries) are widely credited with four key achievements in the creation of modern football codes. First of all, the evidence suggests that they were important in taking football away from its "mob" form and turning it into an organised team sport. Second, many early descriptions of football and references to it were recorded by people who had studied at these schools. Third, it was teachers, students and former students from these schools who first codified football games, to enable matches to be played between schools. Finally, it was at English public schools that the division between "kicking" and "running" (or "carrying") games first became clear. The earliest evidence that games resembling football were being played at English public schools — mainly attended by boys from the upper, upper-middle and professional classes — comes from the Vulgaria by William Horman in 1519. Horman had been headmaster at Eton and Winchester colleges and his Latin textbook includes a translation exercise with the phrase "We wyll playe with a ball full of wynde". In 1633, David Wedderburn, a teacher from Aberdeen , mentioned elements of modern football games in a short Latin textbook called "Vocabula." Wedderburn refers to what has been translated into modern English as "keeping goal" and makes an allusion to passing the ball ("strike it here"). There is a reference to "get hold of the ball", suggesting that some handling was allowed. It is clear that the tackles allowed included the charging and holding of opposing players ("drive that man back"). A more detailed description of football is given in Francis Willughby's Book of Games, written in about 1660. Willughby, who had studied at Sutton Coldfield School, is the first to describe goals and a distinct playing field: "a close that has a gate at either end. The gates are called Goals." His book includes a diagram illustrating a football field. He also mentions tactics ("leaving some of their best players to guard the goal"); scoring ("they that can strike the ball through their opponents' goal first win") and the way teams were selected ("the players being equally divided according to their strength and nimbleness"). He is the first to describe a "law" of football: "they must not strike [an opponent's leg] higher than the ball". English public schools were the first to codify football games (in particular Eton (1815) and Aldenham (1825)) They also devised the first offside rules, during the late 18th century. In the earliest manifestations of these rules, players were "off their side" if they simply stood between the ball and the goal which was their objective. Players were not allowed to pass the ball forward, either by foot or by hand. They could only dribble with their feet, or advance the ball in a scrum or similar formation. However, offside laws began to diverge and develop differently at the each school, as is shown by the rules of football from Winchester, Rugby , Harrow and Cheltenham , during in the period of 1810–1850. By the early 19th century, (before the Factory Act of 1850), most working class people in Britain had to work six days a week, often for over twelve hours a day. They had neither the time nor the inclination to engage in sport for recreation and, at the time, many children were part of the labour force. Feast day football played on the streets was in decline. Public school boys, who enjoyed some freedom from work, became the inventors of organised football games with formal codes of rules. Football was adopted by a number of public schools as a way of encouraging competitiveness and keeping youths fit. Each school drafted its own rules, which varied widely between different schools and were changed over time with each new intake of pupils. Two schools of thought developed regarding rules. Some schools favoured a game in which the ball could be carried (as at Rugby, Marlborough and Cheltenham), while others preferred a game where kicking and dribbling the ball was promoted (as at Eton, Harrow, Westminster and Charterhouse ). The division into these two camps was partly the result of circumstances in which the games were played. For example, Charterhouse and Westminster at the time had restricted playing areas; the boys were confined to playing their ball game within the school cloisters, making it difficult for them to adopt rough and tumble running games. 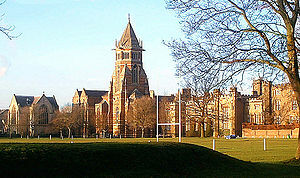 William Webb Ellis, a pupil at Rugby School, is said to have "with a fine disregard for the rules of football, as played in his time [emphasis added], first took the ball in his arms and ran with it, thus creating the distinctive feature of the rugby game." in 1823. This act is usually said to be the beginning of Rugby football, but there is little evidence that it occurred, and most sports historians believe the story to be apocryphal. The act of 'taking the ball in is arms' is often misinterpreted as 'picking the ball up' as it is widely believed that Webb Ellis' 'crime' was handling the ball, as in modern soccer, however handling the ball as the time was often permitted and in some cases compulsory, the rule for which Webb Ellis showed disregard was running forward with it as the rules of his time only allowed a player to retreat backwards or kick forwards.The boom in rail transport in Britain during the 1840s meant that people were able to travel further and with less inconvenience than they ever had before. Inter-school sporting competitions became possible. However, it was difficult for schools to play each other at football, as each school played by its own rules. The solution to this problem was usually that the match be divided into two halves, one half played by the rules of the host "home" school, and the other half by the visiting "away" school. Sports clubs dedicated to playing football began in the eighteenth century, for example London's Gymnastic Society which was founded in the mid-eighteenth century and ceased playing matches in 1796. The first documented club to bear the title "football club" is one in Edinburgh , Scotland , during the period 1824-41. The club forbade tripping but allowed pushing and holding and the picking up of the ball. Two clubs which claim to be the world's oldest existing football club, in the sense of a club which is not part of a school or university, are strongholds of rugby football: the Barnes Club , said to have been founded in 1839, and Guy's Hospital Football Club, in 1843. Neither date nor the variety of football played is well-documented, but such claims nevertheless allude to the popularity of rugby before other modern codes emerged. One of the longest running football fixture is the Cordner-Eggleston Cup, contested between Melbourne Grammar School and Scotch College, Melbourne every year since 1858. It is believed by many to also be the first match of Australian rules football, although it was played under experimental rules in its first year. The first football trophy tournament was the Caledonian Challenge Cup, donated by the Royal Caledonian Society of Melbourne, played in 1861 under the Melbourne Rules. The oldest football league is a rugby football competition, the United Hospitals Challenge Cup (1874), while the oldest rugby trophy is the Yorkshire Cup, contested since 1878. The South Australian Football Association (30 April 1877) is the oldest surviving Australian rules football competition. The oldest surviving soccer trophy is the Youdan Cup (1867) and the oldest national soccer competition is the English FA Cup (1871). The Football League (1888) is recognised as the longest running Association Football league. The first ever international football match took place between sides representing England and Scotland on March 5 1870 at the Oval under the authority of the FA. The first Rugby international took place in 1871. In Europe, early footballs were made out of animal bladders, more specifically pig's bladders, which were inflated. Later leather coverings were introduced to allow the ball to keep their shape. Soccer Ball World - Early History (Accessed June 9, 2006) However, in 1851, Richard Lindon and William Gilbert, both shoemakers from the town of Rugby (near the school), exhibited both round and oval-shaped balls at the Great Exhibition in London. Richard Lindon's wife is said to have died of lung disease caused by blowing up pig's bladders. Lindon also won medals for the invention of the "Rubber inflatable Bladder" and the "Brass Hand Pump". In 1855, the U.S. inventor Charles Goodyear — who had patented vulcanized rubber — exhibited a spherical football, with an exterior of vulcanized rubber panels, at the Paris Exhibition Universelle. The ball was to prove popular in early forms of football in the U.S.A. soccerballworld.com, (no date) "Charles Goodyear's Soccer Ball" Downloaded 30/11/06. "Scientific" football is first recorded in 1839 from Lancashire and in the modern game in Rugby football from 1862 and from Sheffield FC as early as 1865 . The first side to play a passing combination game was the Royal Engineers AFC in 1869/70 By 1869 they were "work[ing] well together", "backing up" and benefiting from "cooperation". By 1870 the Engineers were passing the ball: "Lieut. Creswell, who having brought the ball up the side then kicked it into the middle to another of his side, who kicked it through the posts the minute before time was called" Passing was a regular feature of their style By early 1872 the Engineers were the first football team renowned for "play[ing] beautifully together" A double pass is first reported from Derby school against Nottingham Forest in March 1872, the first of which is irrefutably a short pass: "Mr Absey dribbling the ball half the length of the field delivered it to Wallis, who kicking it cleverly in front of the goal, sent it to the captain who drove it at once between the Nottingham posts" The first side to have perfected the modern formation was Cambridge University AFC and introduced the 2-3-5 "pyramid" formation. In 1848, at Cambridge University , Mr. H. de Winton and Mr. J.C. Thring, who were both formerly at Shrewsbury School , called a meeting at Trinity College, Cambridge with 12 other representatives from Eton, Harrow, Rugby, Winchester and Shrewsbury. An eight-hour meeting produced what amounted to the first set of modern rules, known as the Cambridge rules. No copy of these rules now exists, but a revised version from circa 1856 is held in the library of Shrewsbury School. The rules clearly favour the kicking game. Handling was only allowed for a player to take a clean catch entitling them to a free kick and there was a primitive offside rule, disallowing players from "loitering" around the opponents' goal. The Cambridge rules were not widely adopted outside English public schools and universities (but it was arguably the most significant influence on the Football Association committee members responsible for formulating the rules of Association football). By the late 1850s, many football clubs had been formed throughout the English-speaking world, to play various codes of football. Sheffield Football Club, founded in 1857 in the English city of Sheffield by Nathaniel Creswick and William Prest, was later recognised as the world's oldest club playing association football.However, the club initially played its own code of football: the Sheffield rules. The code was largely independent of the public school rules, the most significant difference being the lack of an offside rule. The code was responsible for many innovations that later spread to association football. These included free kicks , corner kicks, handball, throw-ins and the crossbar. By the 1870s they became the dominant code in the north and midlands of England. At this time a series of rule changes by both the London and Sheffield FAs gradually eroded the differences between the two games until the adoption of a common code in 1877. Various forms of football were played in Australia during the Victorian gold rush, from which emerged a distinct and locally popular sport. While these origins are still the subject of much debate the popularisation of the code that is known today as Australian Rules Football is currently attributed to Tom Wills. Wills wrote a letter to Bell's Life in Victoria & Sporting Chronicle, on July 10, 1858, calling for a "foot-ball club" with a "code of laws" to keep cricketers fit during winter. This is considered by historians to be a defining moment in the creation of the new sport. Through publicity and personal contacts Wills was able to co-ordinate football matches in Melbourne that experimented with various rules , the first recorded of which occurred on July 31, 1858. On 7 August 1858, Wills umpired a relatively well documented schoolboys match between Melbourne Grammar School and Scotch College . Following these matches, organised football matches rapidly increased in popularity. Wills and others involved in these early matches formed the Melbourne Football Club (the oldest surviving Australian football club) on May 17, 1859. The first members included Wills, William Hammersley, J.B. Thompson and Thomas H. Smith. They met with the intention of forming a set of rules that would be widely adopted by other clubs. The backgrounds of the original rule makers makes for interesting speculation as to the influences on the rules. Wills, an Australian of convict heritage was educated in England. He was a rugby footballer, a cricketer and had strong links to indigenous Australians. At first he desired to introduce rugby school rules. Hammersley was a cricketer and journalist who emigrated from England. Thomas Smith was a school teacher who emigrated from Ireland. The committee members debated several rules including those of English public school games. Despite including aspects similar to other forms of football there is no conclusive evidence to point to any single influence. Instead the committee decided on a game that was more suited to Australian conditions and Wills is documented to have made the declaration "No, we shall have a game of our own". The code was distinctive in the prevalence of the mark, free kick, tackling, lack of an offside rule and that players were specifically penalised for throwing the ball. The Melbourne football rules were widely distributed and gradually adopted by the other Victorian clubs. They were redrafting several times during the 1860s to accommodate the rules of other influential Victorian football clubs. A significant re-write in 1866 by H C A Harrison's committee to accommodate rules from the Geelong Football Club made the game, which had become known as "Victorian Rules", increasingly distinct from other codes. It used cricket fields, a rugby ball, specialised goal and behind posts, bouncing with the ball while running and later spectacular high marking. The form of football spread quickly to other other Australian colonies. Outside of its heartland in southern Australia the code experienced a significant period of decline following World War I but has since grown other parts of the world at an amateur level and the Australian Football League emerged as the dominant professional competition. At the fifth meeting it was proposed that these two rules be removed. Most of the delegates supported this, but F. M. Campbell, the representative from Blackheath and the first FA treasurer, objected. He said: "hacking is the true football". However, the motion to ban running with the ball in hand and hacking was carried and Blackheath withdrew from the FA. After the final meeting on 8 December, the FA published the "Laws of Football", the first comprehensive set of rules for the game later known as football (later known in some countries as soccer). The first FA rules still contained elements that are no longer part of association football, but which are still recognisable in other games (most notably Australian football): for instance, a player could make a fair catch and claim a mark, which entitled him to a free kick; and if a player touched the ball behind the opponents' goal line, his side was entitled to a free kick at goal, from 15 yards (13.5 metres) in front of the goal line. In Britain , by 1870, there were about 75 clubs playing variations of the Rugby school game. There were also "rugby" clubs in Ireland, Australia, Canada and New Zealand. However, there was no generally accepted set of rules for rugby until 1871, when 21 clubs from London came together to form the Rugby Football Union (RFU). (Ironically, Blackheath now lobbied to ban hacking. ) The first official RFU rules were adopted in June 1871. These rules allowed passing the ball. They also included the try, where touching the ball over the line allowed an attempt at goal, though drop-goals from marks and general play, and penalty conversions were still the main form of contest. In 1895, disputes amongst members of the RFU led to a breakaway faction creating its own rules and competitions. Over time this has developed into a distinct code of football known as rugby league. The first game of rugby in Canada is generally said to have taken place in Montreal , in 1865, when British Army officers played local civilians. The game gradually gained a following, and the Montreal Football Club was formed in 1868, the first recorded football club in Canada. In 1869, the first game played in the United States under rules based on the FA code occurred, between Princeton and Rutgers . This is also often considered to be the first U.S. game of college football, in the sense of a game between colleges (although the eventual form of American football would come from rugby, not association football). Modern American football grew out of a match between McGill University of Montreal, and Harvard University in 1874. At the time, Harvard students are reported to have played the Boston Game — a running code — rather than the FA-based kicking games favored by U.S. universities. This made it easy for Harvard to adapt to the rugby-based game played by McGill and the two teams alternated between their respective sets of rules. Within a few years, however, Harvard had both adopted McGill's rugby rules and had persuaded other U.S. university teams to do the same. In 1876, at the Massasoit Convention, it was agreed by these universities to adopt most of the Rugby Football Union rules, with some variations. 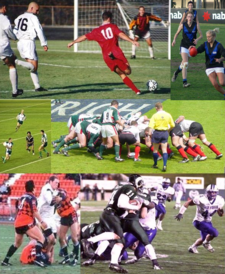 Princeton, Rutgers and others continued to compete using soccer-based rules for a few years before switching to the rugby-based rules of Harvard and its competitors. U.S. colleges did not generally return to soccer until the early twentieth century. 1880, Yale coach Walter Camp, devised a number of major changes to the American game. Camp's two most important rule innovations in establishing American football as distinct from the rugby football games on which it is based are scrimmage and down-and-distance rules. Scrimmage refers to the practice of starting action by delivering the ball from the ground to another player's hand. Camp's original rule allowed this delivery to be done only with the feet; the rule was soon changed to allow the ball to be passed by hand. The rule also established a distinct line of scrimmage which separates the two teams from each other. When a player is tackled, he is ruled down and play stops, while the teams reset on either side of the line of scrimmage. Play then resumes with the delivery of the ball. Teams are given a limited number of downs to achieve a certain distance (always measured in yards). In American football, teams are given four downs to advance the ball ten yards, after which possession of the ball changes. In Canadian football, teams are allowed three downs to advance ten yards. These rules created a fundamental distinction between the North American codes and rugby codes. Rugby is still fundamentally a continuous-action game, while North American codes are organized around running discrete "plays", as defined as starting with the delivery from "scrimmage" and ending with the "down". American football, in its early years, was an excessively violent game, plagued with several deaths and life-changing injuries every year. The violence became so drastic that President Theodore Roosevelt threatened to shut down the game in 1905, should rules not be changed to minimize this violence. Several rule changes were put into place that year, but the most enduring has been the introduction of the legal forward pass, which, like Camp's rule changes of the 1880s, fundamentally changed the nature of the sport. When it became legal to throw the ball forward, an entire new method of advancing the ball emerged. As a result, players became more specialized in their roles, as the different positions on the team required different skill sets. Thus, some players are primarily involved in running with the ball (the running back) while others specialize in throwing (the quarterback), catching (the wide receiver), or blocking (the offensive line). With the advent of free substitution rules in the 1940s and 1950s, teams could deploy separate offensive and defensive "platoons" which led to even greater specialization. Over the years Canadian football absorbed some developments in American football, but also retained many unique characteristics. One of these was that Canadian football, for many years, did not officially distinguish itself from rugby. For example, the Canadian Rugby Football Union, founded in 1884 was the forerunner of the Canadian Football League, rather than a rugby union body. (The Canadian Rugby Union, today known as Rugby Canada, was not formed until 1965.) American football was also frequently described as "rugby" in the 1880s. In the mid-19th century, various traditional football games, referred to collectively as caid, remained popular in Ireland, especially in County Kerry . One observer, Father W. Ferris, described two main forms of caid during this period: the "field game" in which the object was to put the ball through arch-like goals, formed from the boughs of two trees; and the epic "cross-country game" which took up most of the daylight hours of a Sunday on which it was played, and was won by one team taking the ball across a parish boundary. "Wrestling", "holding" opposing players, and carrying the ball were all allowed. The need for a single body to oversee association football had become apparent by the beginning of the 20th century, with the increasing popularity of international fixtures. The English Football Association had chaired many discussions on setting up an international body, but was perceived as making no progress. It fell to associations from seven other European countries: France, Belgium, Denmark, Netherlands, Spain, Sweden, and Switzerland, to form an international association. The Fédération Internationale de Football Association (FIFA ) was founded in Paris on May 21, 1904. Its first president was Robert Guérin. The French name and acronym has remained, even outside French-speaking countries. Both forms of rugby and American football were noted at the time for serious injuries, as well as the deaths of a significant number of players. By the early 20th century in the U.S.A., this had resulted in national controversy and American football was banned by a number of colleges. Consequently, a series of meetings was held by 19 colleges in 1905–06. This occurred reputedly at the behest of President Theodore Roosevelt. He was considered a fancier of the game, but he threatened to ban it unless the rules were modified to reduce the numbers of deaths and disabilities. The meetings are now considered to be the origin of the National Collegiate Athletic Association. One proposed change was a widening of the playing field. However, Harvard University had just built a concrete stadium and therefore objected to widening, instead proposing legalisation of the forward pass. The report of the meetings introduced many restrictions on tackling and two more divergences from rugby: the forward pass and the banning of mass formation plays. The changes did not immediately have the desired effect, and 33 American football players were killed during 1908 alone. However, the number of deaths and injuries did gradually decline. Rugby league rules diverged significantly from rugby union in 1906, with the reduction of the team from 15 to 13 players. In 1907, a New Zealand professional rugby team toured Australia and Britain, receiving an enthusiastic response, and professional rugby leagues were launched in Australia the following year. However, the rules of professional games varied from one country to another, and negotiations between various national bodies were required to fix the exact rules for each international match. This situation endured until 1948, when at the instigation of the French league, the Rugby League International Federation (RLIF) was formed at a meeting in Bordeaux . During the second half of 20th century, the rules changed further. In 1966, rugby league officials borrowed the American football concept of downs: a team could retain possession of the ball for no more than four tackles. The maximum number of tackles was later increased to six (in 1971), and in rugby league this became known as the six tackle rule. The laws of rugby union also changed significantly during the 20th century. In particular, goals from marks were abolished, kicks directly into touch from outside the 22 metre line were penalised, new laws were put in place to determine who had possession following an inconclusive ruck or maul, and the lifting of players in line-outs was legalised. "Soccer" is the prevailing term for association football in the United States, Canada, Ireland, Australia and New Zealand where other codes of football are dominant, but the name "soccer" (or "soccer football") was originally a slang abbreviation of the word "association" and of the 45 national FIFA affiliates in which English is an official or primary language, only three (Canada, Samoa and the United States) actually use "soccer" in their organizations' official names. The rest use football (although the Samoan Federation actually uses both and in Australia and New Zealand, use of the word "football" by soccer bodies is a recent change). Generally around the world today the word "football" and direct translations as such (such as Spanish fútbol and German Fußball/Fussball) is in widespread use as the name for association football. In Francophone Quebec , where Canadian football is more popular, the sport of association football is known as soccer and the Canadian code as football. Sports historian Bill Murray, quoted by The Sports Factor, "Tie Me Kangaroo Down, Sport" (Radio National, Australian Broadcasting Corporation, May 31, 2002) and Michael Scott Moore, "Naming the Beautiful Game: It's Called Soccer" (Der Spiegel, June 7, 2006). See also: ICONS Online (no date) "History of Football"; and Professional Football Researchers Association, (no date) "A Freendly Kinde of Fight: The Origins of Football to 1633". Access date for all references: February 11, 2007. Francis Peabody Magoun, 1929, "Football in Medieval England and Middle-English literature" (The American Historical Review, v. 35, No. 1). Online Etymology Dictionary (no date), "football"
Julian Carosi, 2006, "The History of Offside"
The exact name of Mr Lindon is in dispute, as well as the exact timing of the creation of the inflatable bladder. It is known that he created this for both association and rugby footballs. However, sites devoted to football indicate he was known as HJ Lindon, who was actually Richards Lindon's son, and created the ball in 1862 (ref: Soccer Ball World), whereas rugby sites refer to him as Richard Lindon creating the ball in 1870 (ref: Guardian article). Both agree that his wife died when inflating pig's bladders. This information originated from web sites which may be unreliable, and the answer may only be found in researching books in central libraries. Bell's Life in London and Sporting Chronicle (London, England), Saturday, January 07, 1865; Issue 2,229: "The Sheffield party, however, eventually took a lead, and through some scientific movements of Mr J Wild, scored a goal amid great cheering"